Rodgers and Edwards reformed Chic in 1992 and recorded new material for the album Chic-Ism. In 1996 they released a Japan-only album consisting of old Chic material rerecorded with guest vocalists, Chic Freak and More Treats . Edwards and Rodgers performed with Sister Sledge, Steve Winwood, and Slash in a series of commemorative concerts in Japan. 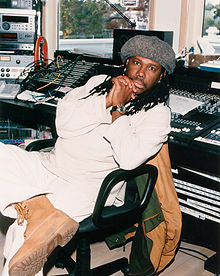 Edwards died following a concert on April 17, 1996. Rodgers discovered his body. He later said that when Edwards died he "cried like a baby and suffered intensely but eventually realised the best tribute to him would be to carry on and be the best I could be." A year later, Rodgers returned to Japan to pay homage to his fallen partner, and in 1999, Rodgers released Live at the Budokan, a live recording of Edwards' final performance.The album was not overdubbed or changed in order to keep the recording pure. 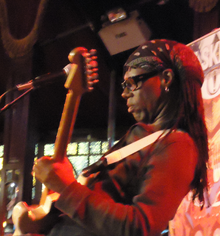 Wikimedia Commons has media related to Nile Rodgers.